Kotaku Australia have recently introduced a new feature for Australian developers called Show & Tell. When they asked for developers to submit answers to five questions describing their studio and current projects we couldn’t resist. 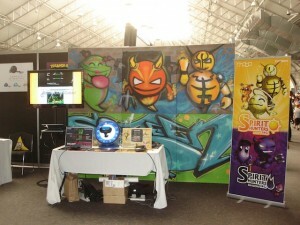 It gave us a great chance to tell some more people about escapeVektor: Chapter 1 and Spirit Hunters Inc. Welcome to Show and Tell, a (relatively) new regular that gives local Australian indie developers the chance to show their latest work, whether its a finished game or a work in progress. Today we’re speaking to an indie studio that is no stranger to the WiiWare, DSi and iOS market. Bruce Thomson from Nnooo gave us a preview of what they’re working on now. We are an independent game development studio based in Sydney, developing downloadable games primarily for Nintendo consoles. Our first game was called Pop, a bubble popping game for up to four players for the Wii. It was one of only six titles picked for Nintendo’s US WiiWare launch in 2008. We subsequently made a single player version of the game, Pop+ Solo, for the Nintendo DSi and iPhone. We’ve also released a series of personal organiser applications for the Nintendo DSi called the myLifeCollected series. The most successful of the applications, the myNotebook series, has sold almost a quarter of a million units.